Today, Technician wages are skyrocketing and more and more of the vehicles coming into auto repair shops require some form of diagnostics. 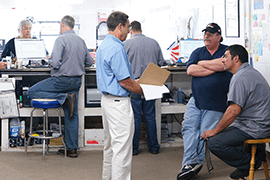 With the ongoing high cost of Technician training, equipment, and information systems, business owners can no longer afford to give away the Technician’s time. This is a crucial “profit leak” that afflicts many shops. This course guides shop owners in understanding the source of the profit leak and demonstrates improvements to the process of charging for diagnostic labor while providing the customer with value.